Arsonists set fire to an office of the Greek neo-Nazi party Golden Dawn in central Athens on Monday, causing extensive damages. The incident comes the day after a 19-year old Iraqi was knifed to death by five men, presumed to be associated with the far-right political party. 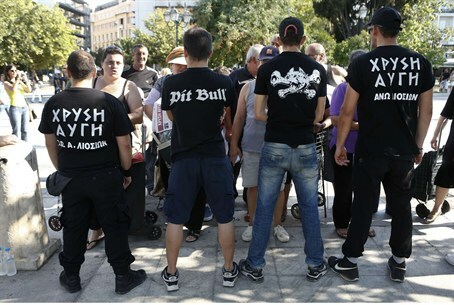 Golden Dawn first gained notoriety in 1991 for attacking Albanian immigrants and participating in the massacre of Muslims in Bosnia, The International Business Times reported. Recently, however, the party has seen a steady rise in support due to the economic crisis plaguing the country, receiving 7 percent of the vote in the country’s national elections, a significant increase from the 0.46 it received just three years prior. The party’s offices, located on the fourth floor of the building, were empty at the time of the attack and no casualties were reported. The fire was caused by flammable liquid, which the unknown perpetrators lit outside the front door of the offices after entering the building, according to The Globe and Mail.